And all our other loved animals! Saw the following on the Mother Nature Network site and knew today was the day to share it with you. Which Thanksgiving foods are safe for pets? Thanksgiving is all about being grateful, of course, but it’s also about food — lots and lots of food. Your kitchen and dining room table will be overflowing with all sorts of tasty offerings, as tempting smells fill the air from early morning until late at night. While entertaining your guests and seeing to your culinary responsibilities, don’t forget to keep a watchful eye on your pets. It will be hard for them to resist the food from your feast, but some items can cause problems for our furry friends. Here are some Thanksgiving foods that are hazards and others that are OK in moderation. 1. Turkey: Unless you’re serving a vegetarian meal, the centerpiece of the holiday meal is a turkey, and how could you let your four-legged buddy miss out? Just do so in moderation and watch what you serve, cautions the American Society for the Prevention of Cruelty to Animals. If you offer your pet a small bite, make sure that it’s well-cooked and has no bones. Raw or undercooked turkey can contain salmonella bacteria, which can make your pet sick. Never give your pet turkey bones. 3. Mashed potatoes: If you get to the potatoes before they’re smothered in butter, milk and salt, you’re in luck. It’s OK to offer your pet a small dollop of plain cooked spuds. 4. Sweet potatoes: These orange tubers are a healthy alternative to white potatoes, as long as you get them to your pet before they’re smothered in marshmallows, butter or brown sugar. A small, plain cooked bite is OK.
5. Gravy: Skip this rich addition to your pet’s meal. If you want to liven up a doggy or kitty dinner, add a dash of low-sodium chicken broth instead. 6. Green beans: These tasty green veggies are a healthy treat year-round. They’re full of vitamins and low in calories. Just be sure to avoid any extra toppings like melted butter, garlic or fried onions. 7. Carrots: These veggies are good for your pet, served cooked or raw. They’re high in fiber and vitamins and low in calories. Plus crunching on raw carrots can be good for a dog’s teeth. Just make sure you don’t feed them to your pet if the carrots are swimming in a sugary glaze. 8. Cranberry sauce: Check what’s in your classic holiday concoction. Some recipes are high in sugar or have alcohol, neither of which is good for pets. Other recipes include grapes, raisins or currants, points out the American Kennel Club, which are toxic to animals. Feeding a small bite of plain cranberry sauce is probably OK, but your pet may not even like it. Some critters turn up their nose at the tart taste. 9. Pumpkin pie: Most pet owners know plain, canned pumpkin is a good thing to help with irregular digestion, but that doesn’t mean pumpkin pie has the same benefits. This tasty holiday mainstay has lots of sugar and spices that aren’t necessary or beneficial for your pet. Plus, the whipped cream or topping may be too rich for dogs and hard to digest for lactose-intolerant cats, says Vetstreet. If you want your BFF to get a taste of the season, offer a scoop of plain, canned pumpkin instead. Watch where you put things. You probably have a lot more going on in the kitchen than usual. Don’t leave garbage bags unattended or food within reach, tempting counter surfers. Beware of bread dough. If you’re making homemade bread, keep it out of your pet’s reach. When a dog or cat eats raw yeast bread dough, the unbaked dough expands in a warm, moist stomach, as the sugars are converted to carbon dioxide gas and alcohol. The result is bloat and alcohol poisoning, which can be a life-threatening emergency. Keep an eye on alcohol. Don’t leave out cups of spiked beverages for your pet to lap up, but also remember that there’s alcohol in some other items like fruitcake. Just a small amount of alcohol (by human standards) can be toxic for pets. Well done, Mary Jo, and a Happy Thanksgiving to you and to all you dear readers. In view of all that’s been happening these last few weeks, this is perfect! We are exactly one month away from Christmas Day! Not sure if that’s scary or satisfying. For years, I have always embraced mid-Winter’s Day on December 21st as the bottom of the slope; so to speak. Thus on that basis Christmas Day is satisfying. Anyway, tomorrow is Thanksgiving Day in this fine, new country of ours and I was wondering what to write to recognise both the importance, current and historical, for Americans and, at a more parochial level, for yours truly. Because, for sure, at the start of this year I wouldn’t have imagined in my wildest dreams that by Thanksgiving Day I would have a book available on Amazon! Then along comes the perfect answer to my pondering as to what to write. A gorgeous post written by Kate Johnston of 4am Writer‘s fame. Even better, Kate giving me permission to republish it in this place. So to all my readers and followers: Happy Thanksgiving. There once was a tree where writers could go and put down stories in the thin bark. Over time, the stories began to bleed into each other until the day came when the tree could take no more stories. The writers didn’t have any other place to go. They tried to write in the sand dunes, but the wind just blew the words around into gibberish. They tried to write in the sky, but the rains came and washed everything away. They tried to write on the animals and birds but got bitten and clawed for their trouble. One little girl missed writing too much. Her stories were piling up inside her like rotten apples on the ground, and she needed a place to write them. She went searching. Over the hills and behind some mist that beckoned with gauzy fingers. She found a secret place where trees grew by the dozens, trees with papery bark that wanted to give stories. She told no one of her discovery, wanting to keep all the trees to herself. She spent day after day writing story after story upon tree after tree. When she had scribed all her stories, she abandoned the secret place and never returned. She didn’t tell a single soul about the trees that gave stories, for fear that someone wouldn’t like what she wrote, would laugh at her, wouldn’t understand. But while she was gone, attending to other things like school, friends, growing up and starting a family, her stories began to fade away. With no one to savor them, the tales began to disappear from the trees. Stories cannot exist without readers. And writers cannot exist without stories. The girl, now an old woman, returned to the secret place with her grandson, thinking he would appreciate the magic of the stories on the trees. Imagine her devastation when she saw that her words were destroyed, scabbed over by new bark and punctured by holes from insects and birds. It was plain to the girl, now an old woman, the trees could no longer give to a writer who had stopped writing. She fell to her knees and wept. She couldn’t even start over. It’d been too long since she’d come to the secret place and had forgotten how to write at all. Her grandson scraped away the new growth, traced his finger over the faintest of marks, trying to find the long-lost stories. It was no use, not by himself. He was young and couldn’t yet read. They went back to the world where they found a baker, a postman, a teacher, an electrician, and a dancer, all of whom could read and longed to write stories. The old woman and her grandson brought their new friends to the secret place to find the lost stories, but still, it was no use. The stories were gone forever. It had been too long since the girl, now an old woman, had written them that she couldn’t even remember how they went, or what they were about, or why she wrote them at all. All she knew was that when she wrote, she’d felt indescribable joy. She’d fooled herself into thinking that was enough. The girl not knowing then as the old woman knows now that you must tend to joy if you want joy to stay. Together, the friends wrote anew, wrote stories into the bark like paper. They shared their ideas and questions and hopes. They took the time to feel and find meaning in all of the stories. They laughed and cried and debated over worlds they created. They left comments with hearts to show how much each story moved them. They talked about how they couldn’t wait to bring a husband or a mother or a friend to the writers’ trees to show them the stories that grew there. The girl, now an old woman, watched her friends’ stories blossom and grow with each reader that visited the writers’ trees. She saw the joy on her friends’ faces, saw how the joy stayed because they kept doing the one thing they loved: writing. She wondered if she dared try again, to bring a story to life here, even though she’d failed so miserably in the past. Her friends walked the old woman to a new tree. If you love it so, they said, if writing brings you joy, they said, then write you must and never give up, they said. The old woman took to the tree and wrote. Dear readers: I am going to take a break for one day, so my next post will be on Friday. You all have a wonderful time wherever you are in the world. Today’s post is inspired by a comment left by Virginia Hamilton to a post that was published in this place back on 27th September, 2009. The post was called Sticks and stones. This is a flavour of the post. I make no apologies for today’s post being more emotional and sentimental. Remember the old adage, ‘Sticks and stones will break my bones, but words will never harm me’. True courage consists in doing what is right, despite the jeers and sneers of our companions. So if in 1862 the saying was referred to as an ‘old adage’ then it clearly pre-dated 1862 by some degree. A few days ago, Dusty M., here in Payson, AZ, sent me a short YouTube video called The Power of Words. I’m as vulnerable as the next guy to needing being reminded about what’s important in this funny old world. Then I started mulling over the tendency for all of us to be sucked into a well of doom and gloom. Take my posts on Learning from Dogs over the last couple of days, as an example. then let me close by reminding us all that courage is yet something else we can learn from dogs. Virginia is a gifted teacher in Indialantic, FL. She uses her love of animals to teach students about giving back and community service. Her students volunteer at animal shelters and help train dogs so they are more easily adoptable. By doing this they get outside of the classroom and learn important life skills. To that end, I am going to do nothing more than quote a chunk from a forthcoming chapter of my book: Learning from Dogs. 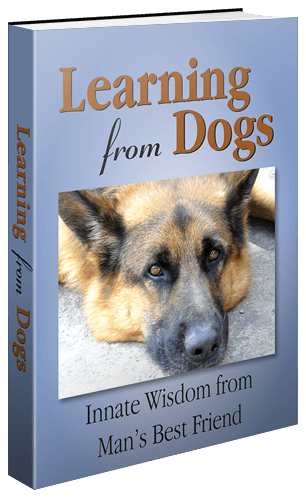 The chapter is the first in Part Five: Dog qualities we have to learn. What follows is the last 400 words of that chapter. Let’s turn to the world of novels. Some book authors make a distinction between unconditional love and conditional love. In the sense that conditional love is love that is earned through conscious or unconscious conditions being met by the lover. Whereas in unconditional love, love is given to the loved one no matter what. Loving is primary: an acting of feelings irrespective of will. There’s another aspect of unconditional love that relates commonly between individuals and their dogs. That is that our love for a dog encompasses a desire for the dog to have the very best life in and around us humans. Take the example of acquiring a new puppy. The puppy is cute, playful, and the owner’s heart swells with love for this adorable new family member. Then the puppy urinates on the floor. One does not stop loving the puppy but recognises the need to modify the puppy’s behaviour through love and training than, otherwise, continue to experience behaviours that would be unacceptable in a particular situation. Having explored the concept of love and how dogs offer us the beauty of unconditional love, how should we adopt a loving approach to the world, and why? It’s the little things that count is a famous truism and one no better suited to the world of love. Little things that we can do in countless different ways throughout the day. Sharing a friendly word and a smile with a stranger, dropping a coin or two into a homeless person’s hands or, better still, a loaf of bread or a chocolate bar. Being courteous on the road, holding a door open for someone at your nearby store, showing patience in a potentially frustrating situation. Never forgetting that we have two ears and one mouth and should use them in that proportion, be more attentive when a loved one is speaking with us, engineer periods of quiet contemplation, understand that the world will not come to an end if the television or ‘smartphone’ is turned off for a day. The list of loving actions is endless. Because this world of ours so desperately needs a new start and that start must come from a loving attitude to each other, to the plants and animals, and to the blue planet that sustains us. We need our hearts to open; open enough to tell our heads about the world of love. It would be lovely, Virginia, if this could be read out to your classes. Even better if young peoples’ thoughts, responses, and questions could be posted here as comments. Yes, we’ve all made it another year. All of you, every single one of you, including all the animals – be grateful for this last year take care this next year! So how to close this post? Well by just enjoy something that Cynthia sent in a week ago by clicking here. A meaningful Thanksgiving at so many levels. In September 1620, a small ship, the Mayflower, left Plymouth, England carrying a 102 passengers. After a difficult crossing lasting 66 days, the Mayflower anchored near the tip of Cape Cod. One month later, the Mayflower crossed Massachusetts, where the Pilgrims, as they are now commonly known, began the work of establishing a village at a new Plymouth. In November 1621, having produced a successful corn harvest, the settlers organised a celebratory feast. 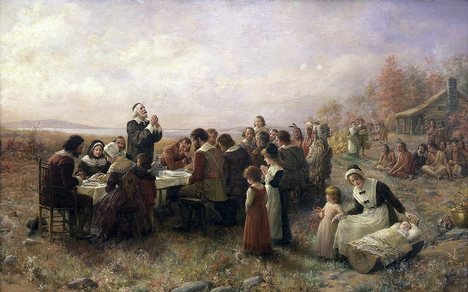 The First Thanksgiving at Plymouth" By Jennie A. Brownscombe. In December 2007 a Virgin flight pushed back from the stand at Gatwick Airport in England en route to Los Angeles airport. On board was yours truly. Two days later, a Aeromexico flight, again with me on board, pushed back from the stand at LAX for the short flight down to Hermosillo Airport in the State of Sonora, Mexico. 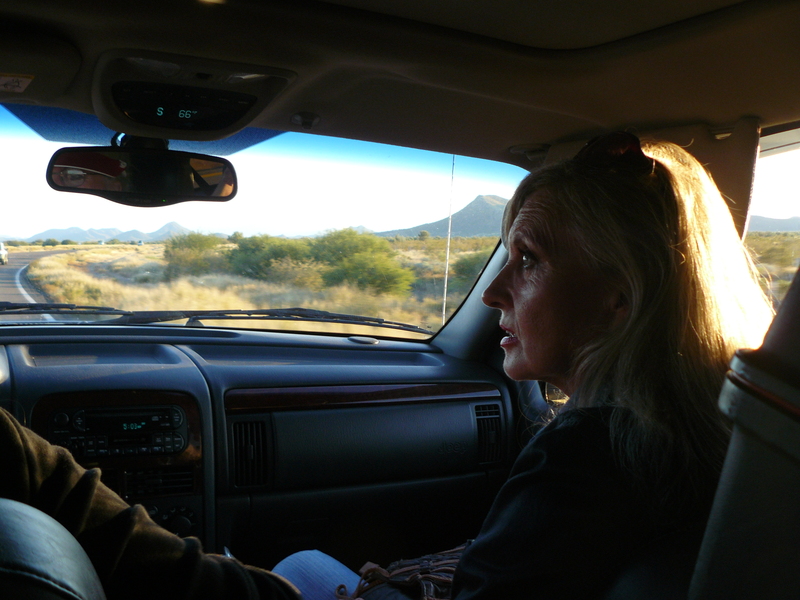 That same afternoon, around 2pm, I was met by Sue at Hermosillo airport ready for the relatively short drive down to San Carlos. I was there for a Christmas holiday courtesy of Sue and Don, her husband. With Sue to meet me at the airport was Jean, a good friend of many years standing. Jean was originally a Londoner, having been born just a few miles from where I was born. Now she was settled in San Carlos after her American husband died in 2005. We all headed off in Sue’s car for the journey to San Carlos. Little did I know that just a few days later at a local dinner and dance spot in San Carlos when I got up and asked Jean for a dance something magical would happen when I put my arm around Jean’s waist. That evening was a 20th. Fast forward 35 months, not only to the day but practically to the hour and that magic in our lives is still there in abundance. 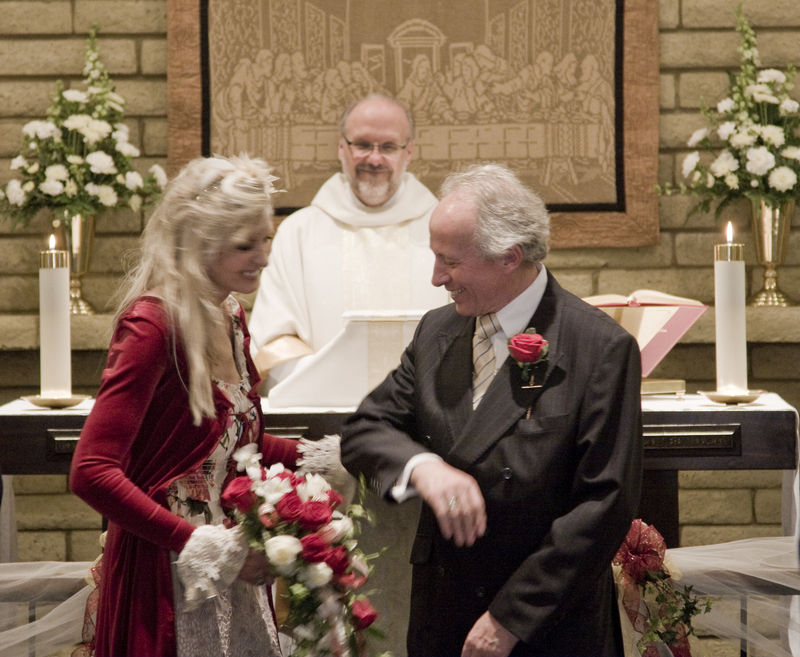 For Jean and I were married in St Paul’s Episcopal Church, Payson, Arizona on the 20th November in front of the Reverend Dan Tantimonaco. That marriage gives me the right to apply to the US Government for Resident status and so, today, Thanksgiving Day 2010, Jean and I will also have our first celebratory feast in gratitude to starting our married lives as new Americans.